When you think of 1920's fashion, what comes to mind? For me, it's probably the flapper style. The shape was loose and boxy and details were everywhere. Pleats, ruffles, tissue hems and contrasting bands. Plus the iconic draped pearl necklace and boa seem to be what makes the 'flapper' style stand out to us almost 100 years later. 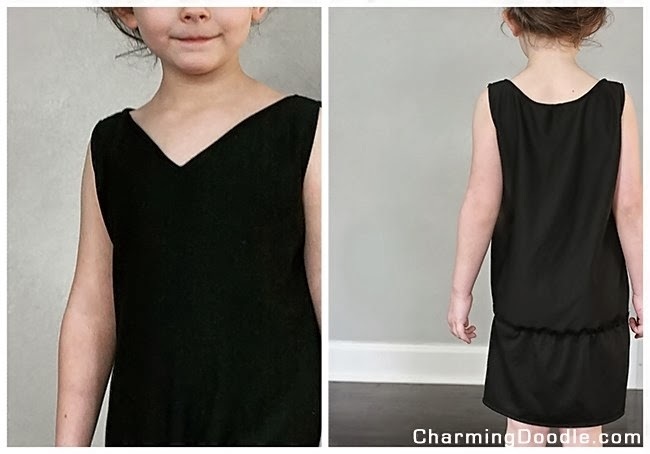 Inspired by the shape and possibilities of flapper style, I made a dress for my 5 year old and want to show you how different trims and elements can make it costume-y or just like a fun dress for a little girl to wear today. I made a very basic black knit dress. It has a dropped waist and the lower part is a little ruffled section. Simple. In the summer she could wear the dress just like this, or I could even rip the bottom part off and she'd have a cute top. The fun part about having such a comfortable, basic dress is that you can add lots of different things to it and achieve whatever look you're going for. Like feathers. 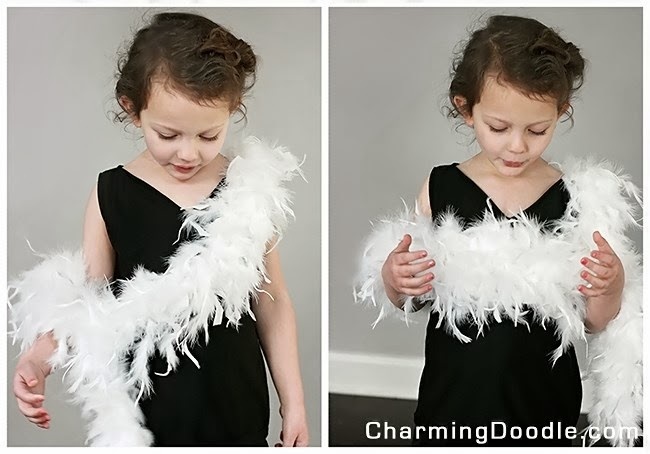 What little girl doesn't love playing with a boa? Or pearls. 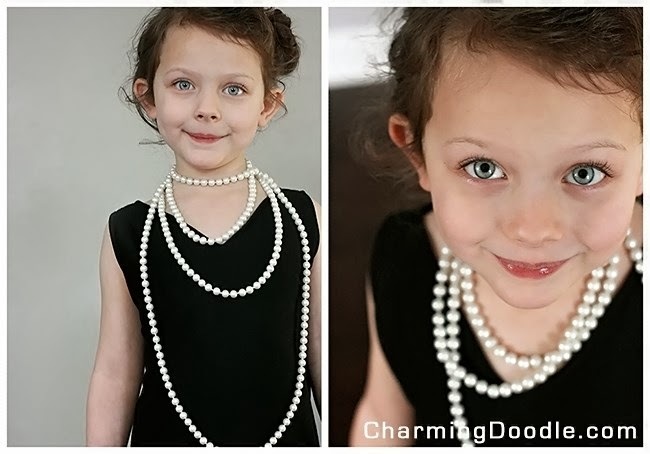 The pearls were Emma's favorite thing to play with during our little photo shoot. I showed her the pictures later and she said "oh, it looks like a necklace." She had thought I was letting her play with beads and had no idea what a string of pearls were like. I guess it shows how often I wear pearls...I don't think she had ever seen them out of my jewelry box! If you browse around any fabric store you'll find oodles of fun trims that could fit the 1920's style. I think of Art Deco style in this era so I picked up two different trims I liked (from Hancock Fabrics). 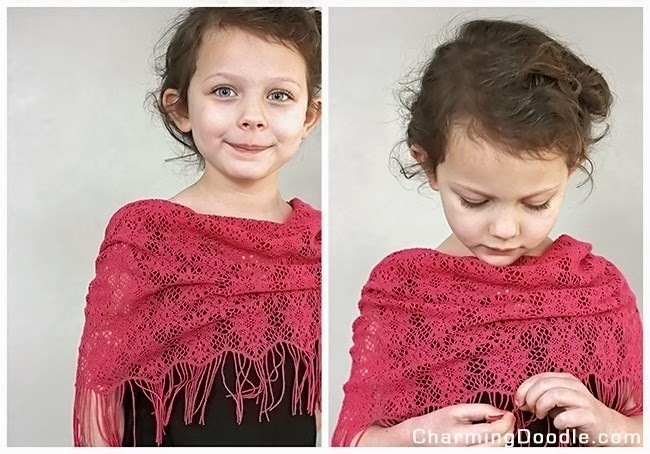 The first one is lace with a big scalloped edge. Then we added the sequined circles trim and I love this one too, even tacking one of the sequined shapes on the shoulder seam of the dress. Another fun thing to throw onto this dress is a fringed lacey shoulder wrap. This is actually just a piece of fabric with the fringe already on it. I didn't even have to finish the edges, it looked good as-is. Tomorrow I'll be sharing a round-up of sewing patterns for dresses, hats and accessories you could use to make your own flapper or Downton inspired look. I hope you'll sew along! If you do, I'd love to see what you make. Use #downtonsewing on Instagram or share your project with us on facebook. That lace trim is amazing! Again, fabulous ideas!!! Thank you for this!